Our team at Broadsuite Media Group has taken a deep dive into the Cisco Spark collaboration platform and this is a first look at how it works, what we think, and what you can expect from using Spark. For starters, with a team of 30+, spread all over the U.S., serving clients in the U.S. and abroad, easy and effective communication and collaboration is a critical part of our business operations. Add to that the fact that we’re immersed in the tech space and very knowledgeable about cloud technology, what’s possible as a result of cloud, and how ease of collaboration makes everything run better, well, let’s just say we’re discriminating consumers. 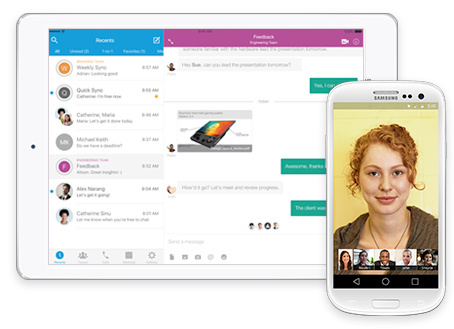 The Spark platform allows communication and collaboration in one spot. Whether you want to make and receive calls, anywhere and from any device, you can do it using Spark. Thanks to Cisco’s expertise by way of WebEx, you can also use spark for video calls and meetings, making collaborating with your team or with clients a breeze. More on that front later. Of course, you can also use Spark for everyday messaging, which means less clutter in email inboxes and more quick exchanges of information, documents, and all the things you need to make your workday and the processes you use to collaborate more seamless and more productive. The Cisco Spark product is a clean, easy to navigate interface. After being long time Slack users, I heard a collective groan from our team when we asked them to move their communication over to Spark. Learning a new platform when you’re already accustomed to one that works great is always a pain. The good news is that the move on the part of our team was and has been pretty seamless. A lot like Slack, but actually better in terms of functionality. Calendar Integration. I mentioned the simplicity of the platform, and the simple, intuitive navigation— that’s a big selling point for us. I also love the fact that Spark integrates with my calendar, so I don’t have to open a separate app or click to a different browser tab when I want to see what I’ve got going on—it’s right there in Spark. Rooms Feature. The Rooms feature offered up by Spark is really pretty sleek. If I want to schedule a meeting with, for example, four members of our team, I can create a “Room” for that conversation or meeting to happen in. We can record that meeting and share it with others who weren’t able to attend, or we can use that recording to refer back to information shared if needed. Our team currently uses a separate platform to do training meetings, so being able to not only collaborate in a platform, but to also use it for training without having to leave and all congregate on a separate platform is incredibly helpful. We are getting ready to have a meeting right now to discuss the design of a new website we’re building for a client, and it’s happening in a Room that we created, using the video call feature, and allowing us to share images and walk through the proposed site architecture together. Kind of cool, huh? Note the look of extreme concentration on my colleague, Eric Vidal’s, face. I’m going to win lots of brownie points with that one. As an aside, and for those with super sleuthing eyes, I’ll also note that the “…undies.doc” reference you see there was an upload by me of an article I’d written for one of our blogs featuring the brand MeUndies®, as we were experimenting with how to use the Spark interface. Nothing nefarious, I’m afraid. Easy. Easy. Easy. What we liked best is that the three of us dove into a video call meeting for the very first time, wanting to share documents, then share screens, and the interface was so intuitive when it came to user experience that we figured it out in no time. And that, my friends, is exactly what I’m looking for when it comes to UX. I’ll bet you agree. Video Recording. One additional feature of Spark that is kind of a deal-maker for our team is that we do tons of training sessions or group meetings. With Spark, you can have a meeting and record it, then share the video with anyone who wasn’t able to attend. Currently, we use Join.me for video meetings and create our video library using that platform. To have this kind of re-usable content all housed under one collaboration solution is pretty awesome. Those are my first glimpse insights after a week or so of using Cisco’s Spark product. I honestly thought it would take quite a lot to make me want to break up with Slack, but in all candor, Spark has got what it takes. I look forward to continuing to explore and will report back on what we find after using the product more extensively. What about you? What do you use for internal (and external) communication, project management, voice/video calling, collaboration, training, etc.? If you’re interested in checking out Spark, you can check it out for free for 30 days. This article was written as part of a series of posts and brought to you in part by the team at Cisco Spark. The opinions expressed here are my own.